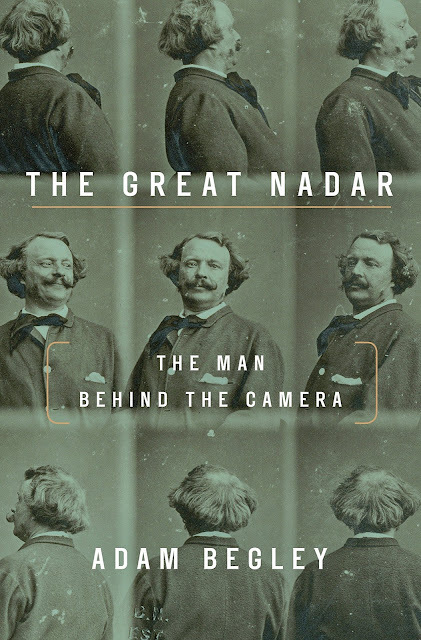 Thank you to Goodreads and Tim Duggan Books for sending me an advanced copy of The Great Nadar: The Man Behind the Camera. "A dazzling, stylish biography of a fabled Parisian photographer, adventurer, and pioneer. A recent French biography begins, Who doesn't know Nadar? In France, that's a rhetorical question. Of all of the legendary figures who thrived in mid-19th-century Paris a cohort that includes Victor Hugo, Baudelaire, Gustave Courbet, and Alexandre Dumas Nadar was perhaps the most innovative, the most restless, the most modern. The first great portrait photographer, a pioneering balloonist, the first person to take an aerial photograph, and the prime mover behind the first airmail service, Nadar was one of the original celebrity artist-entrepreneurs. A kind of 19th-century Andy Warhol, he knew everyone worth knowing and photographed them all, conferring on posterity psychologically compelling portraits of Manet, Sarah Bernhardt, Delacroix, Daumier and countless others a priceless panorama of Parisian celebrity. Born Gaspard-Felix Tournachon, he adopted the pseudonym Nadar as a young bohemian, when he was a budding writer and cartoonist. Later he affixed the name Nadar to the facade of his opulent photographic studio in giant script, the illuminated letters ten feet tall, the whole sign fifty feet long, a garish red beacon on the boulevard. Nadar became known to all of Europe and even across the Atlantic when he launched "The Giant," a gas balloon the size of a twelve-story building, the largest of its time. With his daring exploits aboard his humongous balloon (including a catastrophic crash that made headlines around the world), he gave his friend Jules Verne the model for one of his most dynamic heroes. The Great Nadar is a brilliant, lavishly illustrated biography of a larger-than-life figure, a visionary whose outsized talent and canny self-promotion put him way ahead of his time." "The year is 1865, or possibly 1864. The place is a four-story building on the south side of the boulevard des Capucines, between Le Madeleine and the Opera, strolling distance from the epicenter of fashionable Paris. If you look up, you'll see near the top of the facade of number 35 a name in giant script: Nadar, signed with a flourish in red glass tubing, the letters ten feet high, the whole trademark fifty feet long. at night the sign is gaslight, a garish crimson beacon advertising the studio of the most famous photographer in France. Nadar is a celebrity, renowned not only for his portraits of eminent contemporaries but also for his caricatures, his writings, his radical politics, and his daredevil exploits as a balloonist. Today he will be calling upon several of his talents at once: his is at work on a portrait of himself as an aeronaut, a task that combines self-exposure with self-promotion and self-caricature. His motives, like almost all motives, are mixed. The photography will advertise his art, promote the cause of human flight--the cause closest to his heart (at the moment)--and serve a specific commercial purpose: generate publicity for a memoir of his most notorious ballooning adventure. But he's chronically incapable of suppressing the artistic ambition that has shaped his photographic career--that is, the urge to capture in every portrait an intimate and compelling psychological likeness. This photo will be a triumph."